The Delaware Nurses Association will be holding DNA Spring Conference 2019 at Christiana Hospital-Ammon Center, Newark, Delaware on April 26, 2019. Community-Dwelling Elderly Population's Self Efficacy for Managing Chronic Disease. Thanks to the support and work of our member volunteers, the Delaware Nurses Association provides relevant, evidence-based education to our conference participants. Our conferences are open to all student nurses, registered nurses and advanced practice nurses that work in a variety of settings throughout the state. DNA has done its work to provide quality education and we need YOU to complete the conference experience. DNA recognizes your contribution to our program's success by supplying attendees with contact information and a description of the products and services you provide. As a vendor, you will have multiple opportunities throughout the day to meet face-to-face with participants. Additionally, vendors will be recognized in the pre-conference slide show and participants will be encouraged to visit your table. Set-up for the pre-registration and continental breakfast will begin at 7:30 am. Exhibitors must check in upon arrival. Tables are not assigned and are on a first come, first serve basis. Your exhibit should remain in place until the last break has finished. This exhibitor registration includes one meal. Each additional meal is $40. Exhibitors are welcome to the breakfast and break stations. Deadline for exhibitor registration is April 12, 2019. The Delaware Nurses Association cannot guarantee space availability after that time. In the event an exhibitor cancels participation, refunds will be made as follows: prior to the deadline of April 12, 2019, a full refund will be given. After April 12, 2019, no refund will be given. Prizes may be given from private drawings at any of the exhibits. Exhibitors are responsible for type of prizes and their delivery. The Delaware Nurses Association is not responsible for announcing winners or delivering the prize to the winner. All activities and prizes/promotional items given to attendees must be in compliance with all regulations and guidelines governing gifts to nurses, including those of the American Nurses Association and the American Nurses Credentialing Center. Promotional activities must be identified as such and must be kept separate from continuing nurse education activities. Product promotion material or product-specific advertisement of any type is prohibited in or during the educational activities, except in the designated areas. No product advertisement of any type shall be permitted in the same room as the educational activity or in the walkway to the educational activity room. Commercial support staff is prohibited from engaging in sales or promotional activity in the activity room before, during, or after the activity. It is mutually agreed that the Delaware Nurses Association shall not be liable to the exhibitor for any damage to or loss or destruction of any exhibit or property of an exhibitor or injuries to his/her person resulting from any cause. All claims of any such loss, damage, or injury are expressly waived by the exhibitor. Exhibiting organizations are required to have insurance covering transport of its booth materials and equipment to and from the event facility and during the event. Exhibiting organizations are solely responsible to its agents and employees and to all third persons, including invitees and the public, for all claims, liabilities, actions, costs, damages, and expenses arising out of or relating to custody, possession, operation, maintenance, or control of said leased space or exhibit, for negligence or any other liability relating thereto, and said exhibiting organization does hereby indemnify and hold harmless the Delaware Nurses Association and its agents, employees, and sponsoring organizations against any and all such claims as may be asserted against it. Should any emergency arise, of any nature, prior to the opening conference date that would prevent its schedule opening (destruction or damage to the facility by fire, flood, storms, acts of God, etc., or declaration of any emergency by the state of Delaware or the United States Government), it is expressly agreed that the Delaware Nurses Association may retain portion of the exhibit payment to cover expenses incurred by the Delaware Nurses Association up to the time of the emergency. All points not covered by these rules are subject to the judgment of the Delaware Nurses Association. The Delaware Nurses Association reserves the right to prohibit any display or exhibit or any part of a proposed exhibit which it judges as not suitable or in accordance with ethical standards and those of governing bodies. 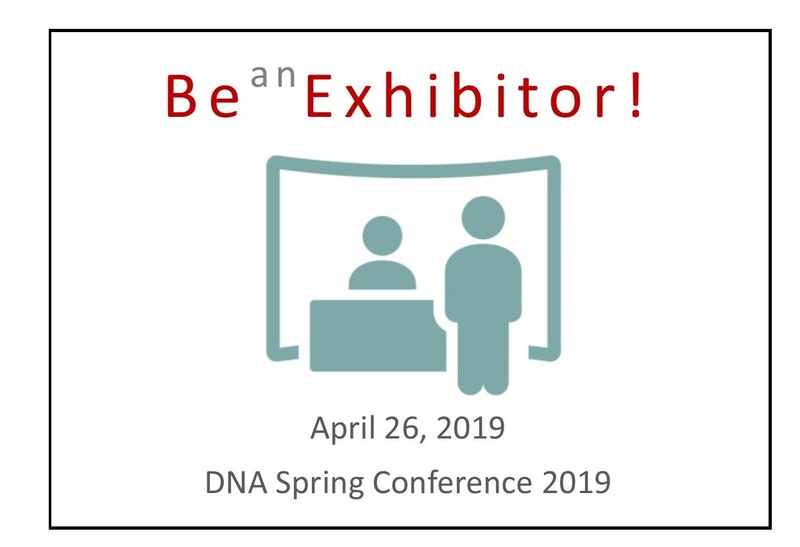 Sponsorship opportunities are also available for the DNA Spring Conference 2019. If paying by check, make payment to Delaware Nurses Association.